DeYoung Natural Area is a work in progress but hikers already have more than 2 miles of trail to explore. On the east side of Cherry Bend Road is the Cedar Forest Trail that makes for a loop of less than a mile and includes a fishing pier and viewing deck on Cedar Lake. On the west side, described here as a 1.2-mile loop, trails first pass the buildings and then skirt small farm fields, upland meadows and stands of hardwoods. Louis DeYoung farmstead straddles Cherry Bend Road, less than 2 miles from M-22, and what was once the Manistee and Northeastern Railroad that is now the popular Leelanau Trail. To generations of locals, the buildings, especially the large barns, indicated they were either escaping the urban clutches of Traverse City or would soon be home again. The farmstead dates back to the 1860s when Henry Campbell cleared the land and then diverted a stream to power a water wheel. DeYoung purchased the farm in 1925 as a 26-year-old newlywed and remained on it for almost 80 years. A true innovator, DeYoung turned the water wheel powerhouse into a machine shop that included light bulbs before standard electricity service was available in the area. He embraced tractor-powered farming early on and was one of the first in Leelanau Peninsula to plant cherry trees. In 2003 at the age of 103, DeYoung and his son approached the Leelanau Conservancy in regard to preserving the farm and the mile of undeveloped shoreline on Cedar Lake. DeYoung died a year later, and in 2008 a 145-acre tract that included the farmstead and its historical buildings was acquired by the conservancy. 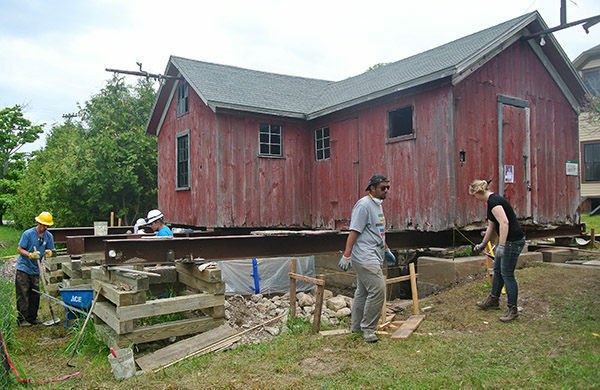 The Leelanau Conservancy turned to Eastern Michigan University’s nationally-recognized Graduate Program in Historic Preservation to assist in preserving the structures and developing an interpretive area. The conservancy also invited local farmers to resume farming and raise livestock in the natural area, using small-scale, sustainable methods such as edible forest gardening. DeYoung is a work in progress but hikers already have more than 2 miles of trail to explore. On the east side of Cherry Bend Road is the Cedar Forest Trail that makes for a loop of less than a mile and includes a fishing pier and viewing deck on Cedar Lake. On the west side, described here as a 1.2-mile loop, trails first pass the buildings and then skirt small farm fields, upland meadows and stands of hardwoods. The loops can be combined for an easy 2-mile outing in this unique natural area where farming and outdoor recreation exist side-by-side and naturally complement each other. On the east side of Cherry Bend Road, in the shadow of a huge barn, is the trailhead and parking for this 0.8-mile loop. The trail immediately crosses the paved Leelanau Trail – watch for cyclists! – and begins as the Fishing Pier Trail, the route to Cedar Lake that was transformed into a handicapped accessible path in 2015. The trail quickly passes the junction with the return of Cedar Forest Trail and then uses a long, curved boardwalk to snake through a stand of mature cedars. In less than a quarter mile you pass a bench along the boardwalk and arrive at a huge deck extended out on Cedar Lake. 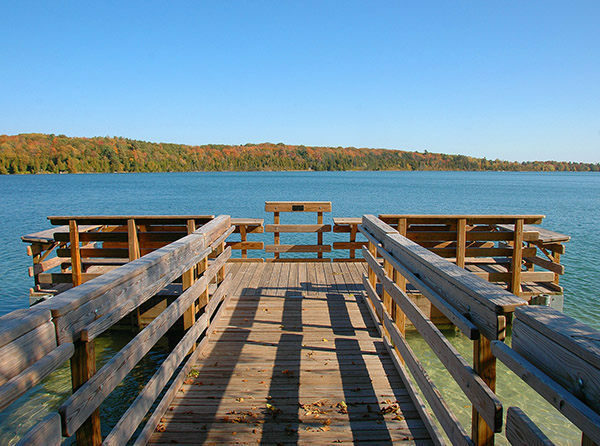 Built as a fishing pier, the reason for the rod holders, the deck is situated at the edge of a drop-off in the 50-acre lake, making it an idea place to cast a line for smallmouth bass, panfish or perch. It also has benches and serves as a wildlife observation area where on a quiet evening it’s possible to see a variety of waterfowl, marsh birds and herons. 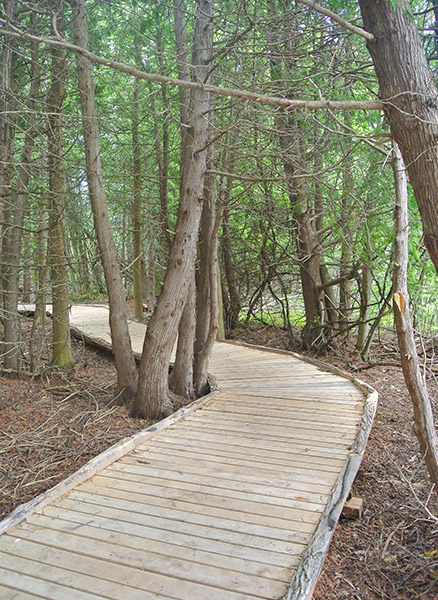 Near the boardwalk bench, Cedar Forest Trail departs to the north and winds through a cedar swamp. You’re close enough to Cedar Lake to see the shoreline through the trees or even hear an occasional water skier in the summer. At Mile 0.5 the trail swings south, passes a bench along the edge of the meadow and returns to the handicapped accessible trail. The trails on the west side of Cherry Bend Road were opened in 2013 and are continually being improved. 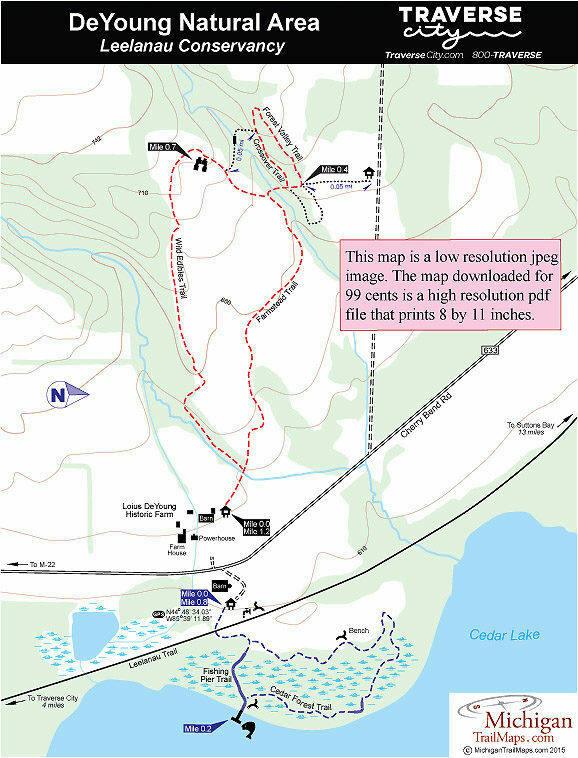 This loop is the most natural route and easiest to follow, much of it marked by blue-tipped posts. The trailhead is just past the restored powerhouse — the Farmstead Trail begins by skirting a small pasture with movable fences that allow livestock to rotationally graze to enrich the soil with nutrients. After crossing a small stream, head right at the junction as the trail passes through remnants of old farm fields and orchards. Within a third of a mile, the Farmstead Trail swings south and skirts a forest of huge maples that shade the stream in a small ravine before reaching a junction. Head north (right) to dip into the ravine and cross the stream along the Forest Valley Trail. On the other side of the stream the trail climbs to a junction on the edge of an open meadow from which the trailhead on Strang Road can be seen. Head south (left) to loop back into a wooded ravine along the Crossover Trail, crossing the stream and returning to the junction at Mile 0.6. Wild Edibles Trail continues south to skirt the old orchard and climbs reaches to the high point of the route. Reached at Mile 0.7, the grassy ridge rises to 710 feet in elevation to provide a nice view of Louis DeYoung’s farm and a slice of Cedar Lake. The trail, so named for what hikers might find to nibble on along the way, including wild blackberries and grapes in late summer, descends off the ridge. You skirt the south side of the old orchard before swinging into the woods and arriving at an old two-track at Mile 1. Head east (left) to return to the trailhead in less than a quarter mile. The Cedar Lake trailhead for the DeYoung Natural Area has a hand pump for drinking water and a vault toilet that is shared with the Leelanau Trail users. DeYoung is open year-round. There are no fees for enjoying the trails. From Traverse City, head north on M-22 and then west on Cherry Bend Road (County Road 633). Within 2 miles the DeYoung Natural Area is posted with trailheads on both sides of the road. A third trailhead and parking area is located a third of a mile west on Strang Road. 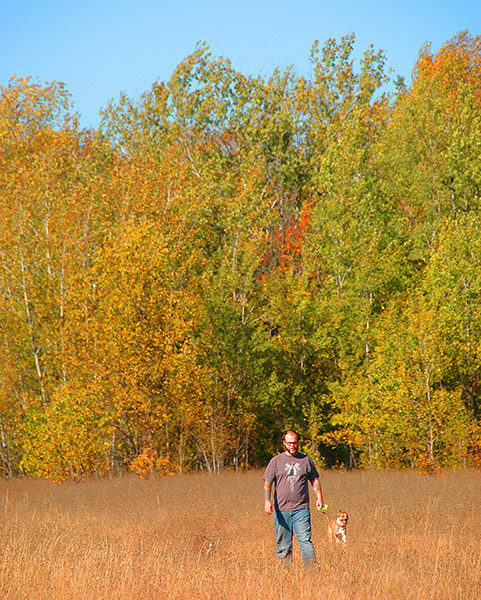 For more information, contact the Leelanau Conservancy (231-256-9665; leelanauconservancy.org). For lodging or travel information contact Traverse City Tourism (800-872-8377; www.traversecity.com).